When Randy and I got married, I didn’t do much of a gift registry. We were in our early 30′s and had both been married before. We had all the sheets and towels and I had a KitchenAid mixer and a food processor. We have plates we liked and more kitchen equipment than we had room for. Of course, there were a few things we really wanted so those items went on our registry list. One item was an ice cream maker. My brother and his lovely wife bought us the ice cream maker, along with the cute bowls you see in the above picture. Soon after we got married, we moved in to a new house. The ice cream maker got put in a box that somehow got hidden in the basement. Then it put in another box that got put in storage while we lived in London. Then that same box came back to our basement and remained unopened until we moved to our current house, a little over 2 years ago. This is the long way of telling you that, in spite of the fact that I make a lot of desserts, I have only made ice cream 3 times in my life. I feel like there is dessert mentor somewhere to whom I owe an apology. If you read food blogs, you have probably read in multiple places how easy and amazing it is to make your own. Listen to those people and listen to me. It’s easy and it’s amazing. Ice cream makers are a relatively inexpensive piece of kitchen equipment, especially for the incredible results they give. I made this ice cream somewhat on a whim. For dessert last night, I planned on serving the Peanut Butter Cup Brownies that I had in the freezer, but had a hankering for something else too. I decided to make ice cream, but didn’t want to spend any more time than necessary on it. Caramel flavors were calling out to me, but I didn’t even want to make a caramel. I settled on this incredible ginger flavor and am so glad I did. Randy loves ginger and I thought it was time to reward him for all the chocolate that has been around here lately. Poor guy. He’s been a trooper. Freeze in an ice cream maker according to manufacturer’s instructions. 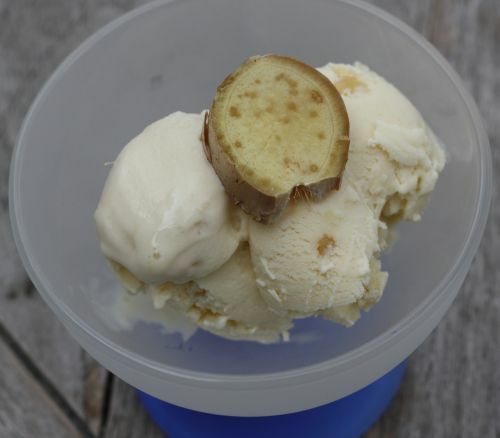 When the ice cream is almost frozen, add the crystallized ginger and churn until blended in, about 15 seconds more. Transfer to a container, cover, and freeze until firm, about 2 hours. That is very interesting…ginger ice cream, I am sure that I’ll love it, since I love ginger. I can almost taste it. The picture looks nice. I recently got hitched (under similar circumstances as yours, so therefore did not have a gift registry), and was generously gifted with my own ice cream maker. I immediately made strawberry ice cream, which was HEAVEN, and so easy to make, and now I fall asleep at night thinking of all the amazing flavors to throw into that whirling little miracle of a machine! And since I’ve gained six pounds since the honeymoon, I’m thinking about frozen yogurt, too. Crystalized ginger is definitely the star! Funny that we’re all making ice cream, tis the sunny season! I seem to keep saying this: I need to get an ice cream maker! With summer on the way, it could get a lot of use very soon. Mine is in the garage. I should start using it. Love that combo. Looks so good.